Two recent ICANN announcements caught our eye because of their relevance to domain investors. The first was ICANN’s placement of a notice that it was seeking to hire its first ever Registrant Services Director-Consumer Advocate. The Job Description states that the position “involves participation in a number of cross-organizational projects in areas such as registrant rights, contract interpretations and compliance, operations, legal policy definitions and implementation with a strong focus on multi-stakeholder collaboration” and that, among other tasks, the selected individual will “become the Registrant Community advocate within ICANN and represent their needs to other teams across the organization.” The Director will report to the President of the Global Domains Division, the separate business unit established within ICANN last year. Consistent with CEO Fadi Chehade’s statement during the London meeting that future staff growth would occur in locations outside ICANN’s Los Angeles headquarters, this position is to be based in Istanbul, Turkey – although applicants must be willing to travel 40% of the time. Curiously, despite the job’s focus on registrant rights, contractual interpretations, and legal policy, the educational experience sought is “BA or BS degree, MS or MBA preferred. Advanced degree in engineering or systems is highly desirable” – and not a law degree. The creation of this position finally puts some meat on the bones of CEO Chehade’s June 2013 declaration that domain registrants are ICANN’s primary customer. As a trade organization representing the interests of registrants who are professional domain investors and developers we have been critical of ICANN’s failure to “walk the walk” on that verbal commitment in the past. ICA now looks forward to working with this new ICANN staffer on issues of importance to registrants, while recognizing that in certain situations involving registrant grievances against ICANN there will be constraints against biting the hand that pays him, or her. Separately, ICANN’s GNSO is soliciting volunteers for the just-launched GNSO New gTLDs Subsequent Rounds Discussion Group. This Group will review the first round of new gTLDs and report findings to the GNSO Council “that may lead to changes or adjustments for subsequent new gTLD application procedures”. With Initial Evaluation just having been completed on all applications submitted in the first round of the new gTLD program, ICANN is putting in place the first step in meeting its commitment to review it thoroughly before a second round commences. From what we have heard, when it does launch down the road the second “round” may not be a round at all, in terms of having a set time window in which applications must be submitted. Rather, once any adjustments in the program are made based upon first round experiences the application window may simply stay open indefinitely, with applicants free to submit a bid for any string at any time. The new gTLD program of course included the new rights protection mechanisms (RPMs) of Uniform Rapid Suspension (URS) and the Trademark Clearinghouse (TMCH), and we expect both to be the subject of discussion and possible suggestions for modification within the new Discussion Group. That’s one major reason why ICA shall be participating. Perhaps once the Registrant Services Director is hired he or she will participate as well — to help assure that registrant rights receive adequate due process as the new gTLD program evolves. Early on it looked like concern over the Obama Administration’s proposal to terminate the U.S. counterparty role on the IANA functions contract might be a one-sided partisan affair. That would be very unfortunate, as Internet freedom as well as its security and stability should raise bipartisan questions. But that is changing. Senator Mark Warner, Democrat of Virginia, last week noted his “serious concerns” and sent a series of pointed questions regarding the NTIA’s announcement to Secretary of Commerce Penny Pritzker. The Dulles airport corridor of Northern Virginia has one of the highest concentrations of technology firms east of Silicon Valley, and the Warner letter may well reflect feedback that his office is receiving from them. 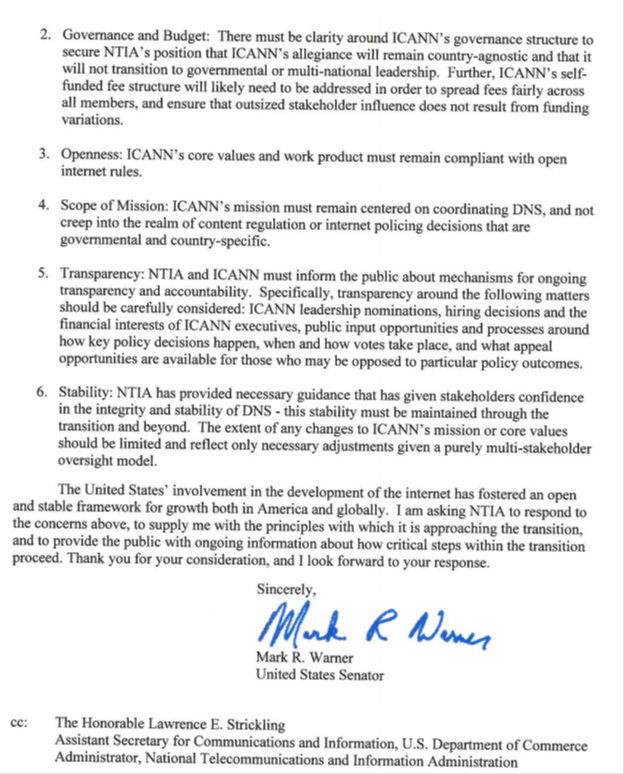 We note in particular that his letter implies that termination of the U.S. role must be accompanied by substantial reforms in ICANN’s fee-based funding as well as greater transparency in ICANN leadership selection, conflicts of interest rules, and policy-making process. 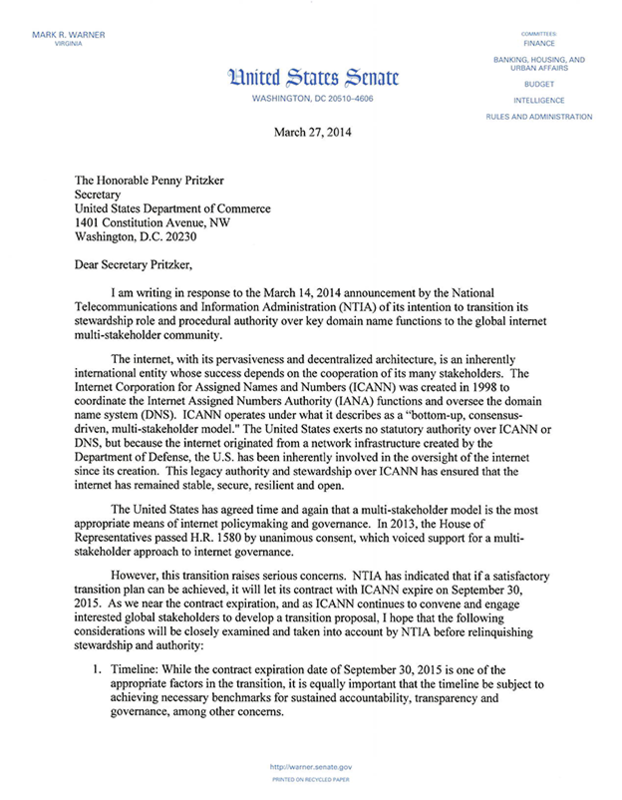 All this serves as evidence that any acceptable transition plan will be very complex and that the process might well extend beyond the September 2015 expiration date of the current IANA contract (but, as NTIA and ICANN have both noted, that date is a goal and not a deadline and the contract provides for two two-year extensions at NTIA’s discretion). Meantime, the House Energy and Commerce Committee has started to post witness testimony for its hearing tomorrow, while the House Judiciary Committee has postponed its hearing from April 3rd to the 10th. The calm is over, and the storm may be about to begin. Congress is back from recess and not one but two Congressional Committees are about to hone in on the implications of the NTIA’s March 14th announcement of its intention to surrender its IANA functions contract counterparty status with ICANN by September 2015. Meantime, an exhausting ICANN meeting has just concluded in Singapore, at which much more was learned about the import of that decision and the complexities of implementing it (more on that in a separate post-jetlag post). Everything ICANN-related, including the Internet governance status of business in general and domainers in particular, is up for grabs and at risk for at least the next eighteen months. This is ICANN week in Washington. Besides those two Hill hearings, two major think tanks are also holding ICANN-related programs. The following day, the Subcommittee on Courts, Intellectual Property and the Internet of the House Judiciary Committee will explore the question of “Should the Department of Commerce Relinquish Direct Oversight Over ICANN?” at 10 am Eastern Time. While the witness list is not yet available, the Subcommittee is likely to focus on whether NTIA has the legal power to make this decision absent Congressional authorization — and the potential fallout for Internet free speech and trademark and copyright protection. Finally, at 11 am on Friday, the respected Hudson Institute will host “A Discussion with the Hon. Lawrence Strickling about the future of ICANN”. Coming just after his Hill appearance, this should be a most interesting session. Thanks to the wonders of the Internet, all these events will be webcast live so that you can be an eyewitness to history. The NTIA has just announced that it plans to turn its IANA functions contract counterparty role over to “the global multistakeholder community” when the current contract expires at the end of September 2015. ICA Counsel Philip Corwin has been asked to speak at “ICANN and Global Internet Governance: The Road to São Paulo, and Beyond”, a program being held on Friday, March 21st in Singapore just before the start of the first ICANN meeting of the year. The full day program is being sponsored by ICANN’s Non-Commercial Users Constituency (NCUC). Corwin will be a member of the day’s first panel discussion, focused on “Setting the Scene: Overview of Recent Agenda-Setting Initiatives”. Other panelists include ICANN Board member George Sadowsky. GoDaddy Hit with another Trademark Infringement Suit – A Hint of Things to Come? Number one domain name registrar GoDaddy has been hit by another trademark infringement lawsuit. Earlier this month GoDaddy failed in its efforts to recuse U.S. District Court Judge Audrey Collins from presiding over a case brought against it by the Academy of Motion Picture Arts and Sciences. [i] The litigation alleges that GoDaddy committed cybersquatting trademark infringement when it “parked” more than 100 AMPAS-related domains, including oscarlist.com, academyawardz.com and academyawardsinc.com. The dispute involved Universal Music, which is rather notorious for its litigiousness, and the website h33t.com, a torrent tracker site that allegedly contained a link allowing downloads of Robin Thicke’s “Blurred Lines” CD (we’d provide a link to the #1 hit song’s rather salacious lyrics, but if we that did Universal might come after us). Key-Systems, which registered the domain but was not hosting it, argued that it was not responsible for the copyright infringement, but the court ruled that it had a duty to investigate and to take corrective action if the copyright infringement was “obvious”. According to Key’s General Counsel, Volker Greimann, “The courts’ definition of what is obviously violating is however extremely broad and the duty to act is expanded to deactivation of the entire domain even if only one file or link is infringing.” We know Volker well from interactions at ICANN meetings, and in an e-mail exchange he explained that Key directed Universal to the webhosting company and the registrant, but that Universal continued its litigation against them instead – we can speculate that their aim may have been less to shut down the offending link than to set a broad new legal precedent. Key is currently considering whether to appeal, with Volker observing, “If left unchallenged, this decision would constitute an undue expansion of the legal obligations of each registrar based in Germany, endangering the entire business model of registering domain names or performing DNS addressing for third parties.” If the ruling stands Key-Systems faces a potential fine of 250,000 Euro ($339,000). For now, the disturbing decision is simply one of a single German court and only has ramifications for registrars subject to German jurisdiction. In the United States, Section 512 of the Digital Millennium Copyright Act (DMCA) provides a safe harbor for online service providers (OSPs) that provide notice-and-takedown capability for the expeditious removal of infringing material and the removal of repeat infringers; OSPs include Internet service providers and certain other online intermediaries (for more background see http://en.wikipedia.org/wiki/Online_Copyright_Infringement_Liability_Limitation_Act and http://en.wikipedia.org/wiki/Online_service_provider). U.S. registrars regularly receive notice-and-takedown requests from copyright owners when they are hosting a particular website alleged to be infringing. We wish Key-Systems well if they decide to appeal this disturbing decision. The registrar marketplace is highly competitive, and the German decision heaps a huge amount of responsibility on a company that only collected a few Deutschemark for facilitating a domain registration and had no further business relationship with the domain registrant or the website.